# If the screen of the app is heavy, please exit other apps. Slide other app screen to upper. 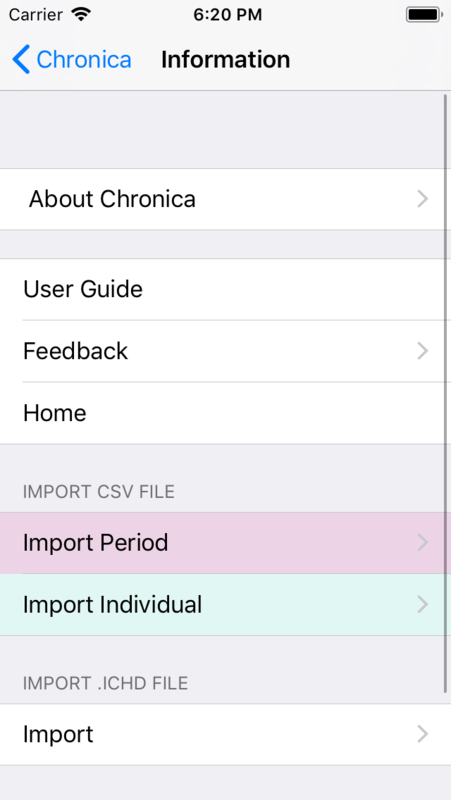 Chronica is an application that a chronological table of individual/organization etc is made easily and to display. You can graspe easily the historical background of each person. 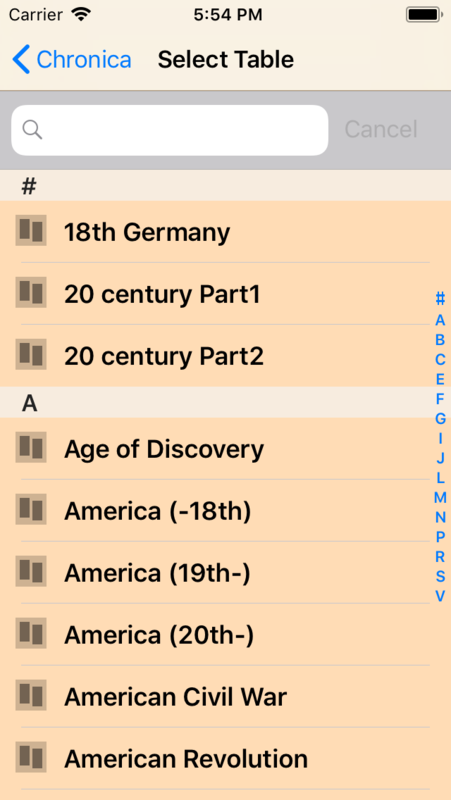 You can arrange more than one chronological table on one screen, and it can be indicated too. It has already contained historical persons and data etc. chronological data. # Mac Edition(Plus), Windows10 Edition are available. Display the chronological table. It's grouped by category. 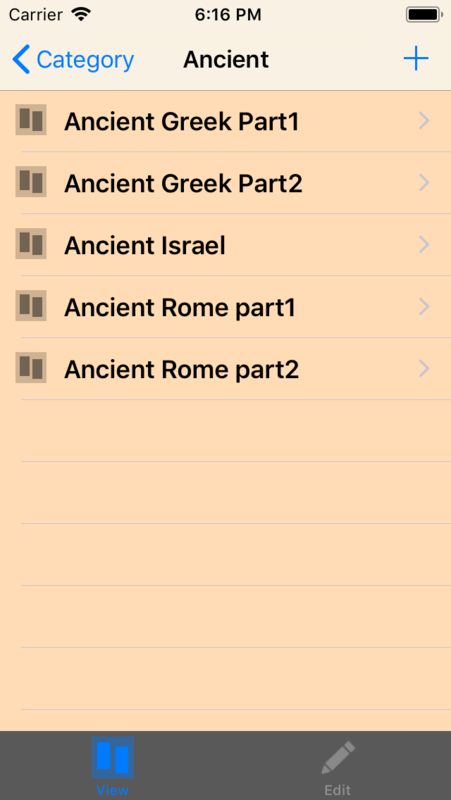 Display the chronological table which is not belonged to the category. 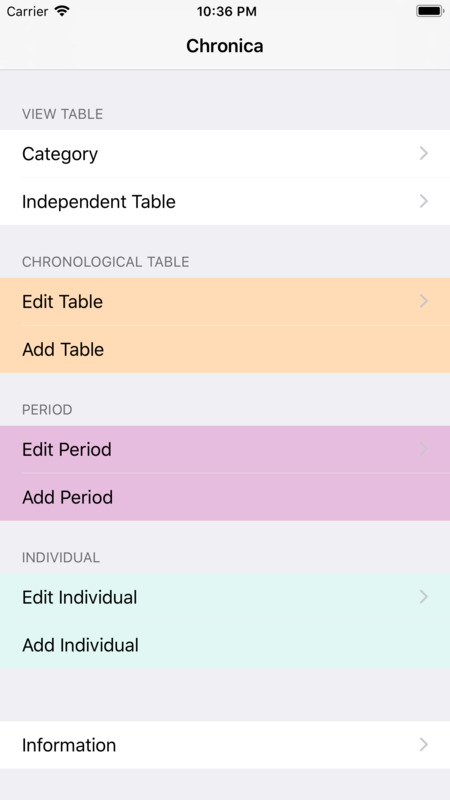 Choose the individual who composes a chronological table, data such as organization, and the name of the chronological table can be changed. 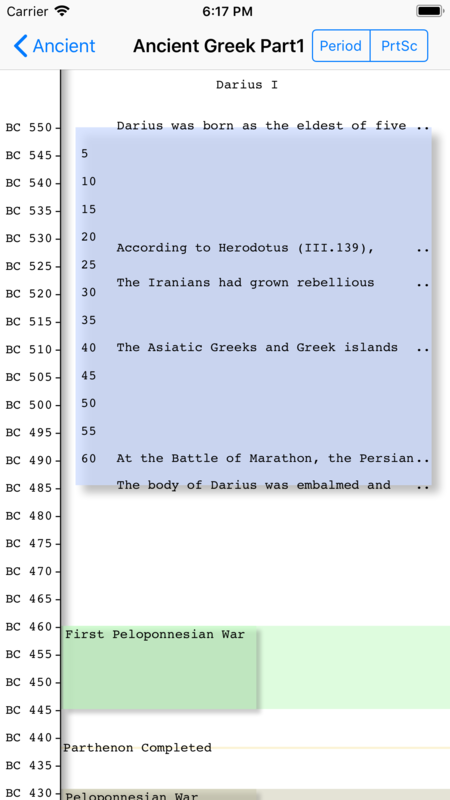 Enter a name and data to construct, and make data on the chronological table. Change the contents of registration of the period data. Change the contents of registration of the individual and the organization. Add an individual and organization. Display the Information screen include "Setting" button. 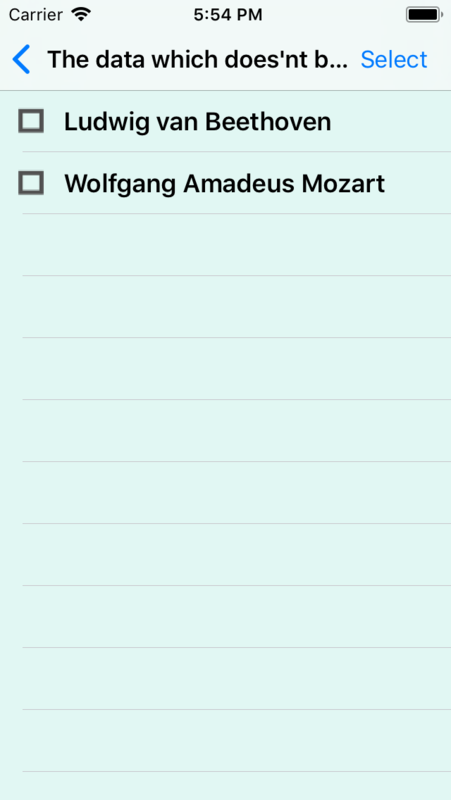 This screen is for making new individual / organization data. 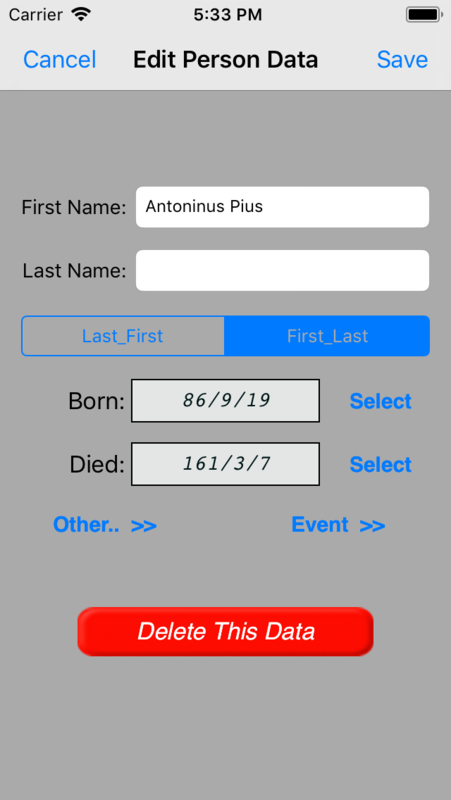 In the Person mode, the individual data provided that Last Name or First Name, the date of Born are indispensable items. In the Organization mode, the individual data provided that Name are indispensable items. The screen mode can be changed. The input items are changed for each mode. The order of the name items can be changed. Tap to open the Date Setting screen. 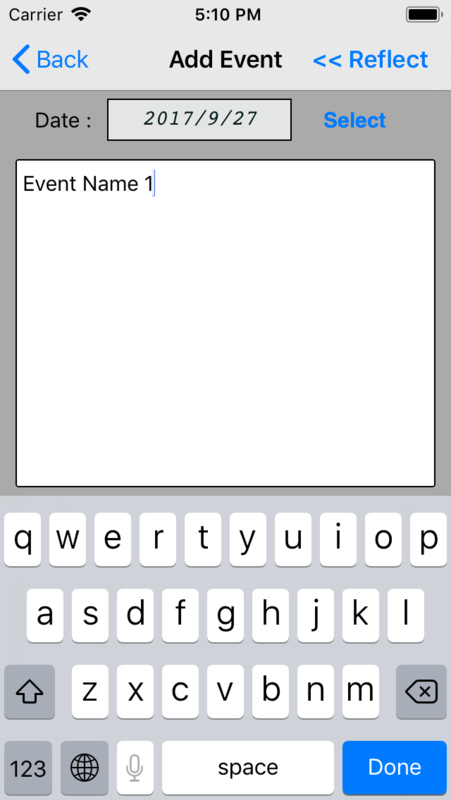 Tap to open the Event List for setting of the event. Tap to open the Other Setting screen. This URL value is used on Table Display screen. The name of its screen is linked to this URL value. if this switch is OFF, the age number is not drawn. It's possible only person type. if this switch is OFF, the range is fitted to other data. Tap to open the Event Import screen. 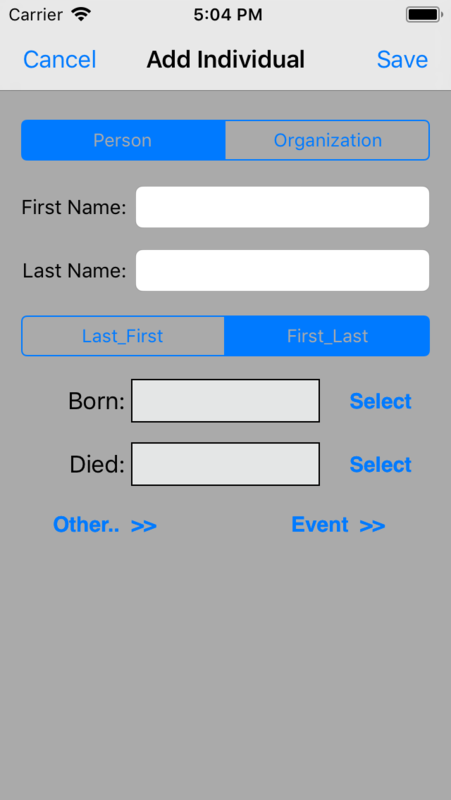 This screen is for inputting the start date(Born:) and the end date(Died:) and the date of the event. The date of B.C. can be established. 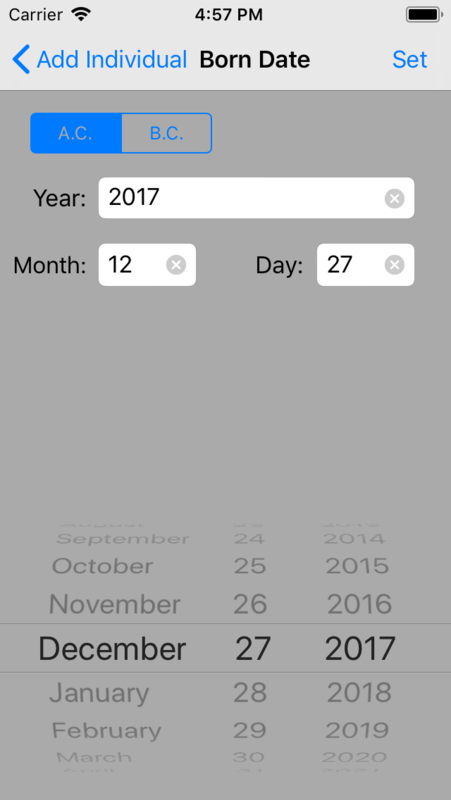 The date of the leap year is not checked on the application side. Only the year value, only the year value and the month value can be inputted. 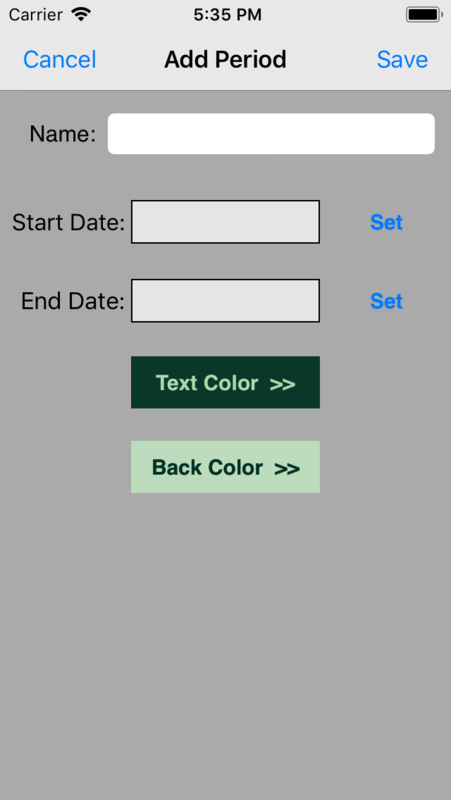 Tap Set button to set the date data to the last screen. [ A.C. | B.C. ] button is the era of the calendar. The date picker under this screen can display only the date after A.C. 1584 . 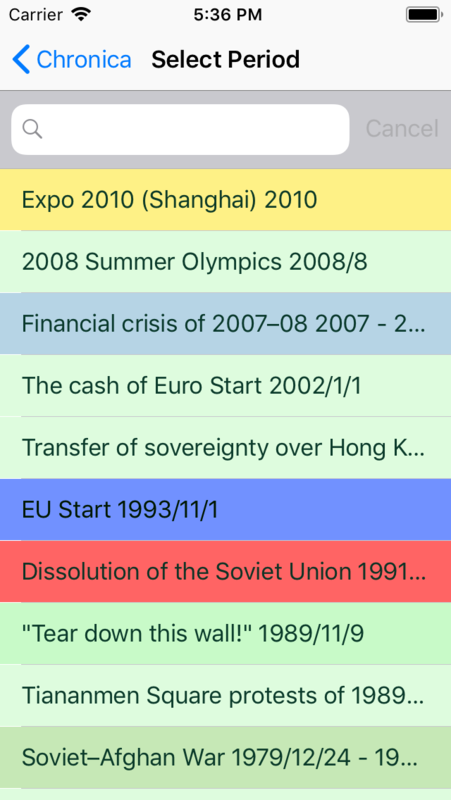 This list manage the event such as individual/organization to display on the chronological table. An event is composed of the date and the content. 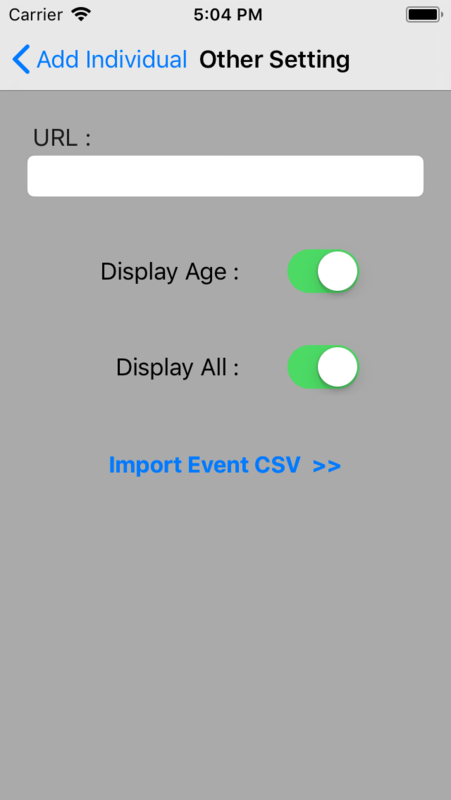 The [ Import >> ] button of the header open the Event Import screen . to open the "Edit Event" screen. and new event data are reflected to the event list. its data removed from the event list. 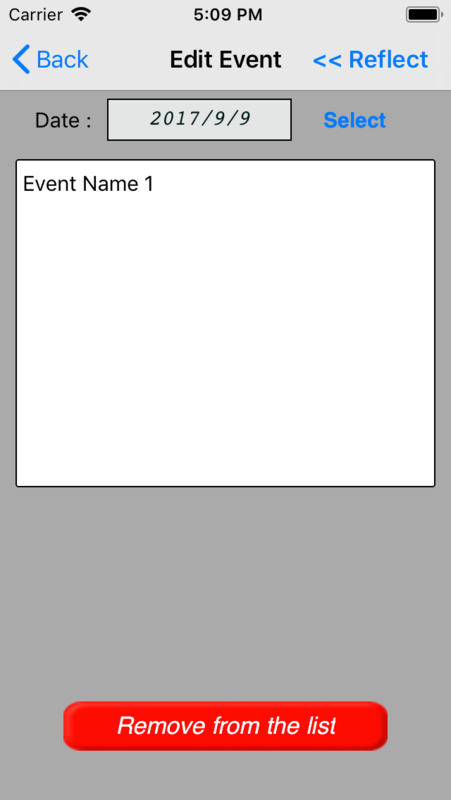 The Import >> button on the top right corner of the event list open the "Event Import" screen . 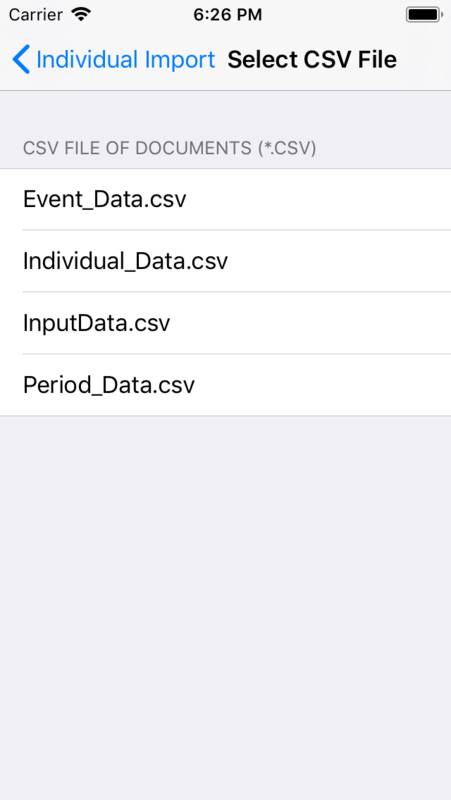 On this screen, it is possible to create Event data from the CSV file in the Documents folder. 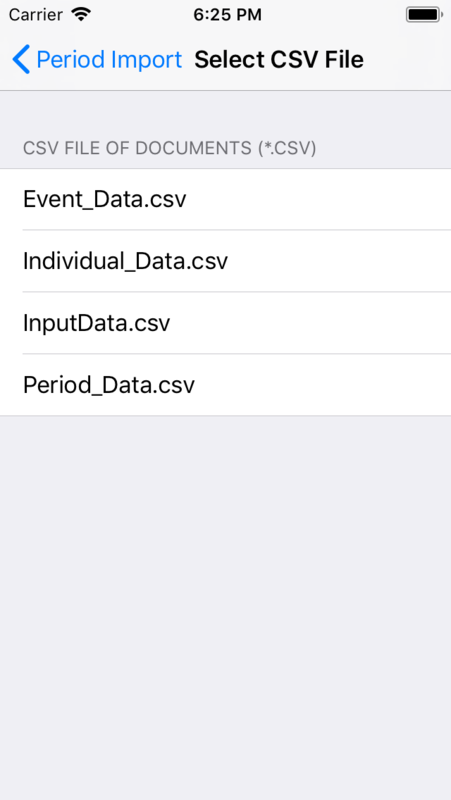 This page explain the CSV file format for Event data. Set the CSV file for input by Select from Documents >> button. 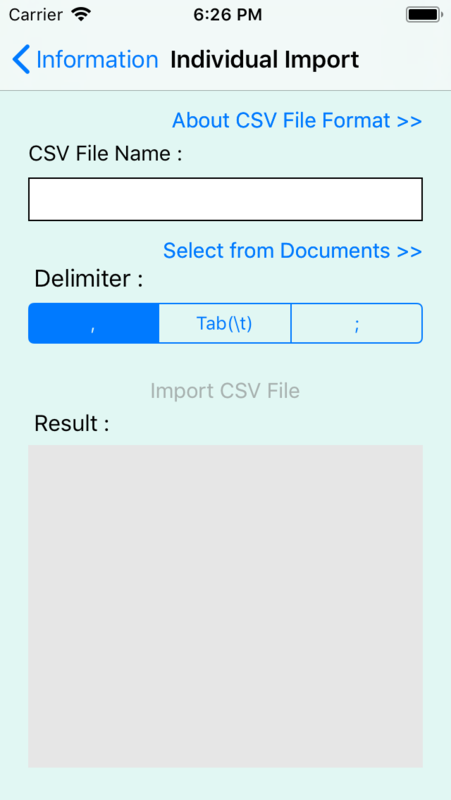 Select delimite character in the CSV file. Tap Import CSV File button. Check the result content of "Result:" textbox. The lines that can not be input is displayed. 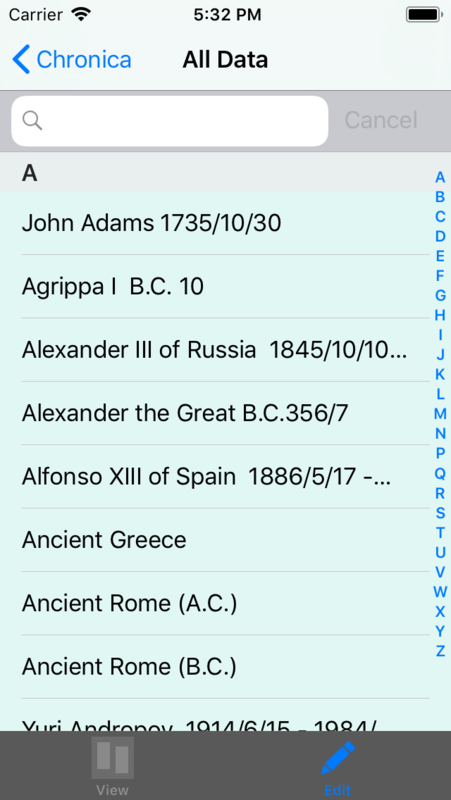 Tap Select from Documents >> to open "Select CSV File" screen . On this screen, the CSV file for input can be selected. This list is the file names of "Documents" folder. These CSV files can be added to iTunes ( DEVICES => Apps => File Sharing ) on PC/Mac. Its CSV file can be deleted with delete key on your keyboard. This screen lists all individual data to edit,delete. The header text field can be searched the name of the data. The Table Display screen of its individual data is opened. Its data are displayed on the Edit Individual screen. The input items of this screen is same as Add Individual screen. When Save button of the header is pressed, the changed data is saved and the screen is returned to the list. This screen is for making new period data. The name and the start date are indispensable items on this screen. the end date is option. 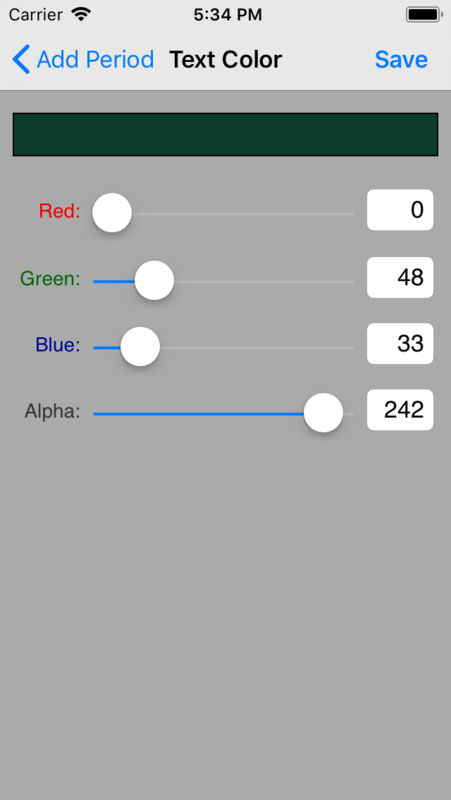 Tap [ Text Color >> ] or [ Back Color >> ] to open the color edit screen. The color is reflected by Save button on the color edit screen. This screen lists all period data. 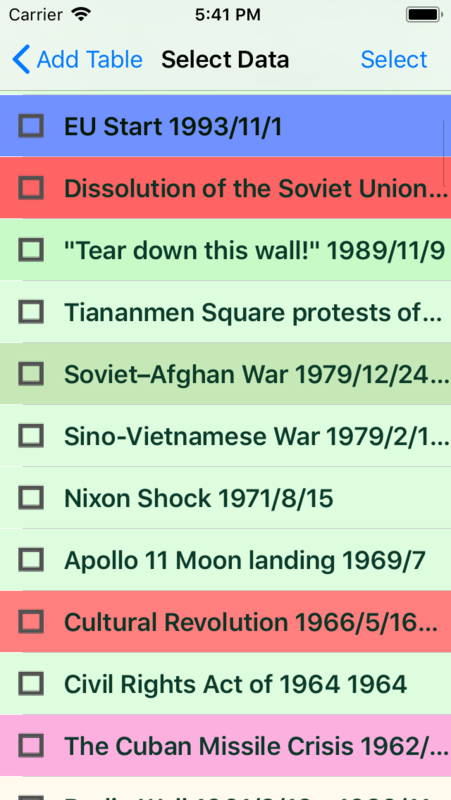 this list is sorted by the start date of the period data. The header text field can be searched the name of the period data. 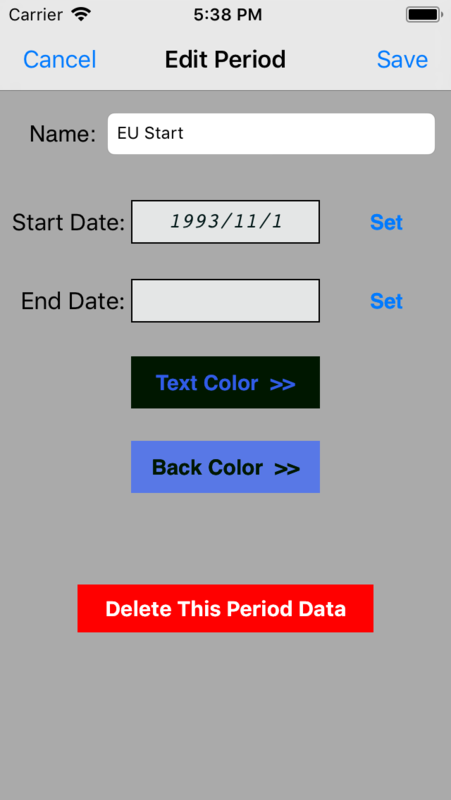 When Delete This Period Data button is pressed, its period data is deleted. 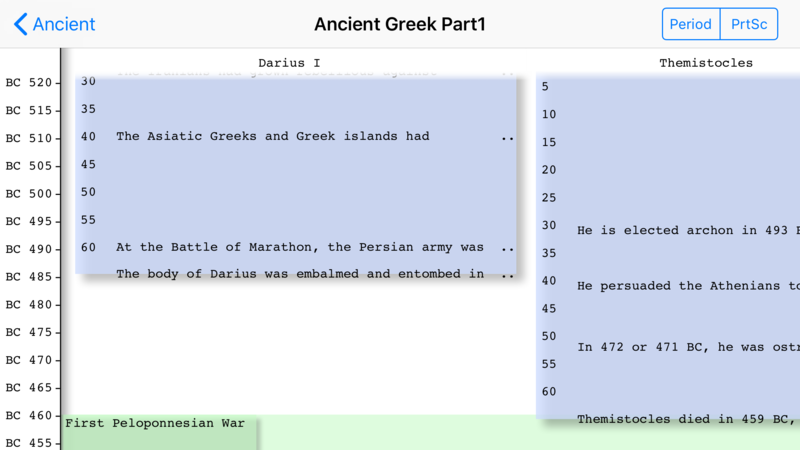 The input terms of Edit Period Screen is same as Add Period Screen. 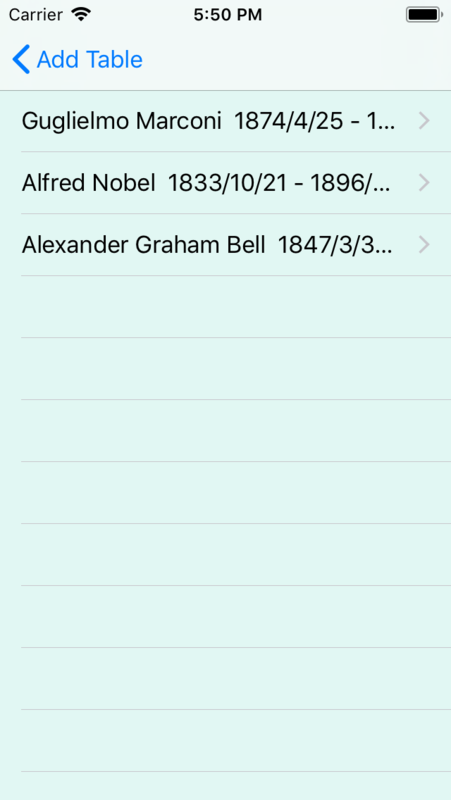 This screen is for making the chronological table data composed by individual/organization data. to open the period list belonged to the table data. Add Period screen is opened. When [ Save ] button of its screen is pressed, new period data is added to this table data. The list of the period data belonged to this table data is opened. 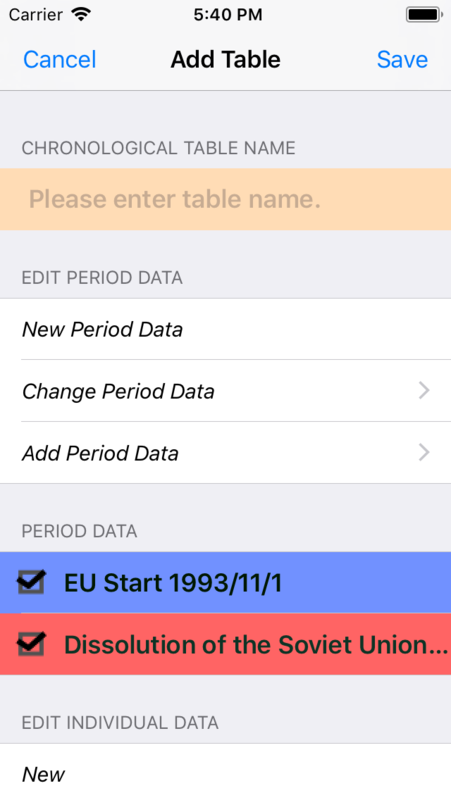 When the period data is selected from its list, Edit Period screen is displayed. The screen is moved to Select Data screen. The period data selected on its screen is added to this table data. to open the list of individual data. 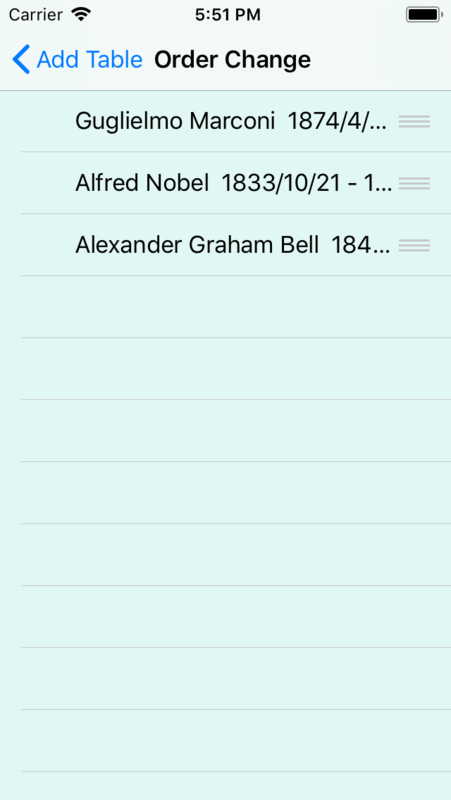 Add Individual screen is opened. When the [ Save ] button of its screen is pressed, new individual data is added to this table data. The list of the individual data belonged to this table data is displayed. When the individual data is selected from its list, the data is displayed in the Edit Individual screen. The screen is moved to the Add Individual screen. The individual data selected from the lists of its screen is added to this table data. The screen is moved to "Order Change" screen. 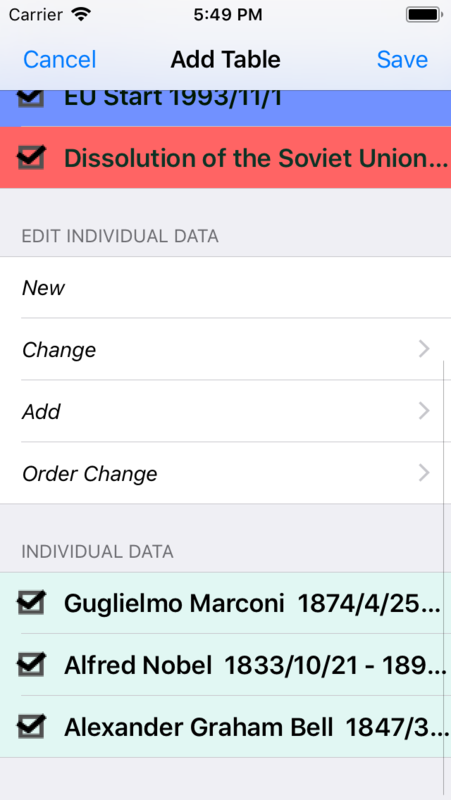 the order of the individual data can be changed on its screen. This is the screen that the individual data which already registed is added to the table data. There are the selectable individual data under each items. The list of individual data which isn't belonged to the table is displayed. All individual data are displayed. These are sorted by alphabet. The table data which do'nt belonged are displayed. The individual data under its list can be selected. When the individual item is checked and tap Select button, these items are added to Add Table screen. 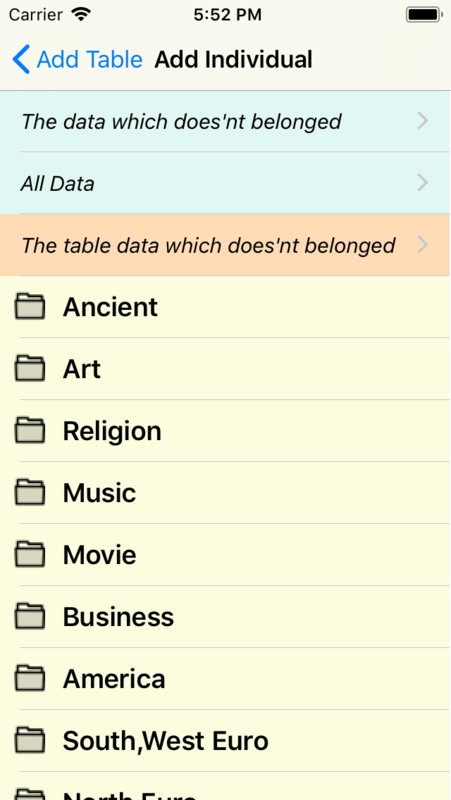 This screen lists all chronological table data to edit,delete. The header text field can be searched the name of the table data. to open the Edit Table screen. The "Edit Table" screen is same as the "Add Table" screen without under 3 terms. The file of its table data is exported to the Documents folder. This file can be taken out from iTunes on PC/Mac. 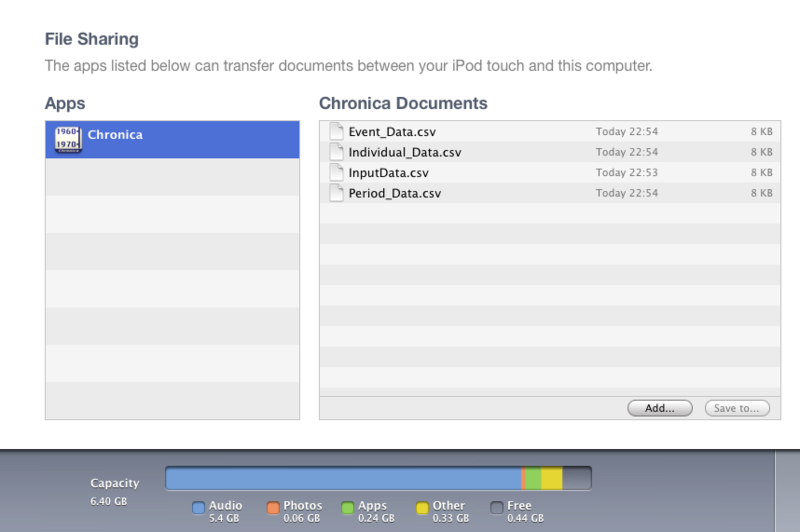 This data file can be import to Chronica app of other iPhone/iPod/iPad. 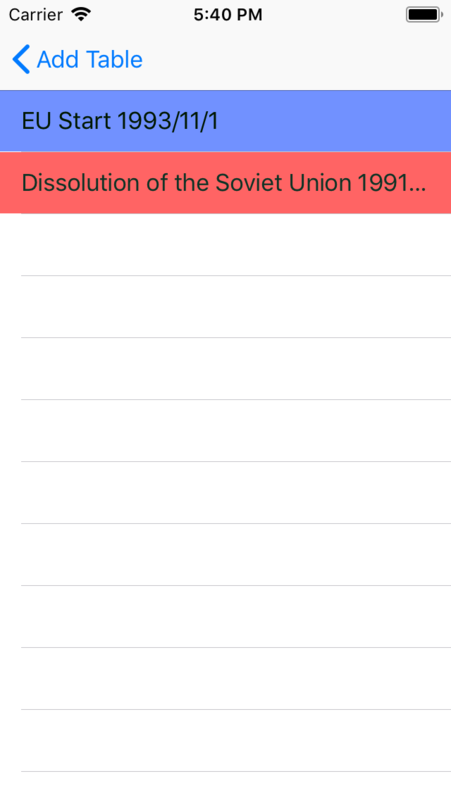 This table data are deleted from this app. This table data are saved and displayed on Table Display screen. 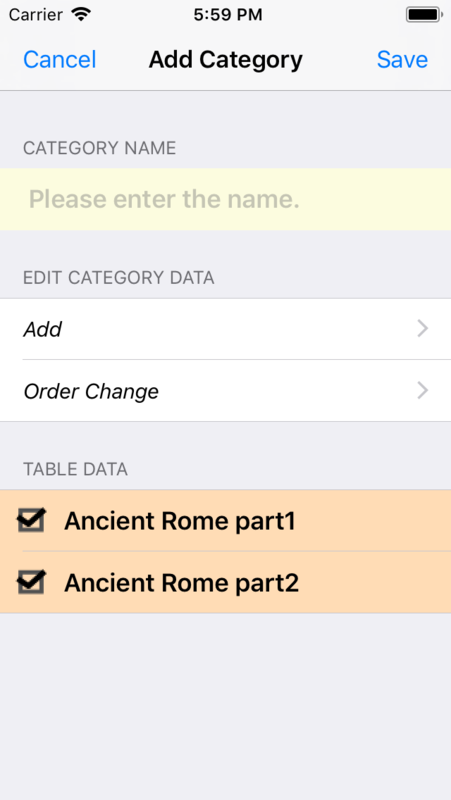 The Category item of main menu is for vidualizing the table data. Add Category screen is opened. The "Order Change" screen of the category is opened. The order of the category list can be changed on this screen. 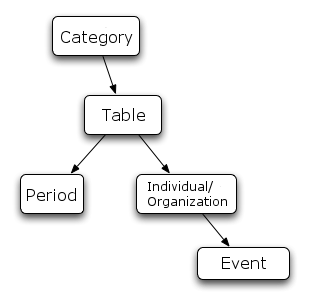 When the category data of the list is selected, the table list of its category is opened. When the category data of the list is selected, its data can be edited on the "Change Category" screen. This category data is made. The name item is necessary. The screen is moved to Add Table screen. Please select from the table items under its screen list. The screen is moved to "Order Change" screen. The order of the table list can be changed on this screen. When the check of the table item is off and [ Save ] button is pressed, these table data are removed from this category data. "Change Category" screen is same as Add Category screen without under 2 terms. This category data is exported to the Documents folder. 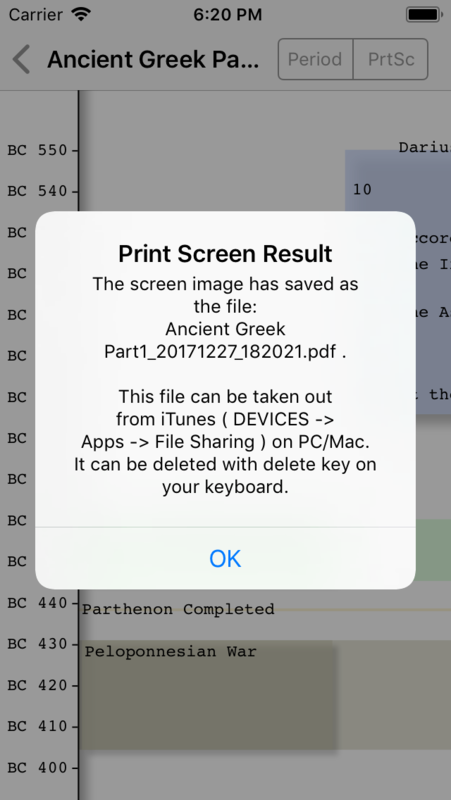 This data file is taken out from iTunes on PC/Mac. 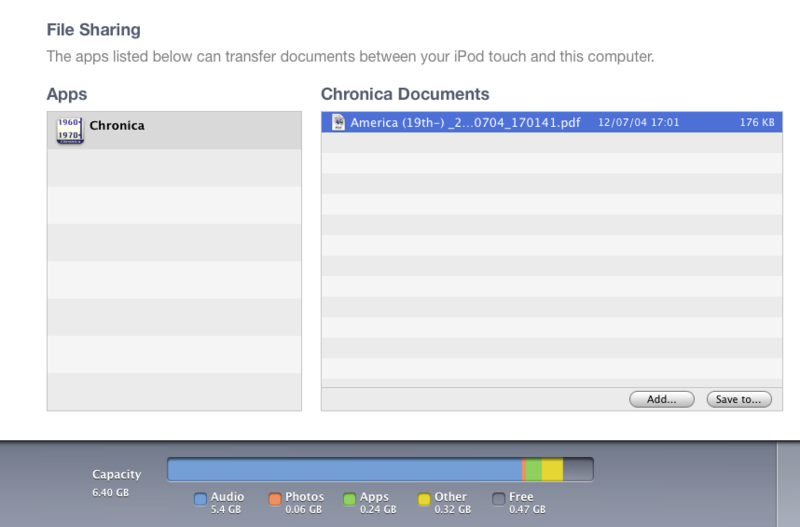 This data file can be imported to Chronica app of other iPhone/iPod/iPad. 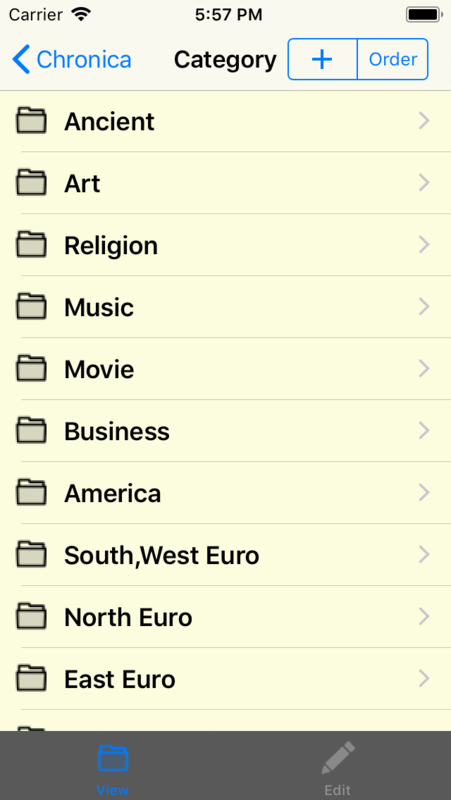 This category data can be deleted from this app. "Add Table" screen is opened. The table data made on its screen is added to this category data. When the table data of the list is selected, its data is displayed on Table Display screen. 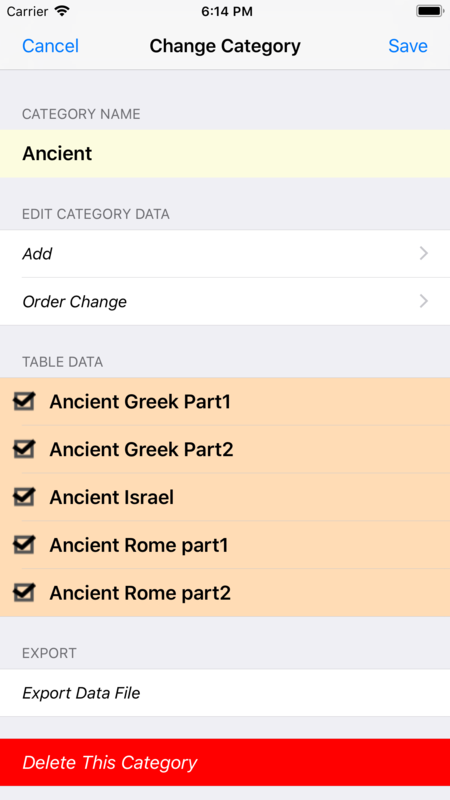 When the table data of the list is selected, its data can be edited on Edit Table screen. Display the chronological table data. When the name is clicked, the web page of the URL of the individual data is opened on the browser. the display switch of the period part. It is indicated with the longer side at the top when iPhone and iPod are turned sideways. You touches it in two fingers so that scaling may do a photograph, the table is expanded. Narrow the space of the finger of two provided that which it cuts down. And, a chronological table can't expand beyond 3,800,000 pixels. 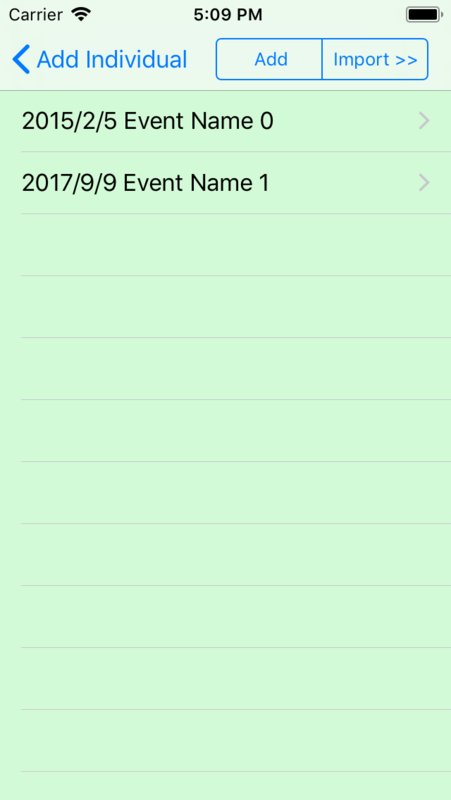 If you touch the event which isn't displayed all, the event is expanded. When it touches it again, it is returned to initial status. When PrtSc button on the header is pressed, the PDF file of the screen is saved. This PDF file can be taken out from iTunes ( DEVICES => Apps => File Sharing ) on PC/Mac. Its PDF file can be deleted with delete key on your keyboard. "Setting" button is opened "Setting" screen. "Import Period" button is opened "Period Import" screen. "Import Individual" button is opened "Individual Import" screen. There are sign display switch. 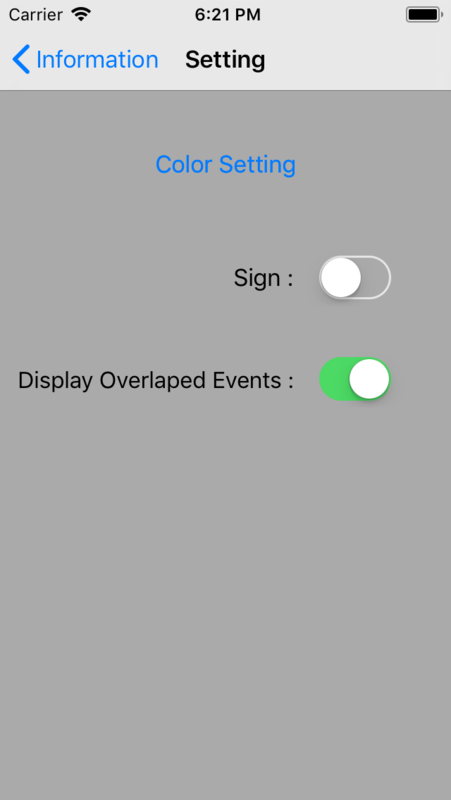 When this switch is turned ON, The events overlaped by one event are displayed in one zoom window. 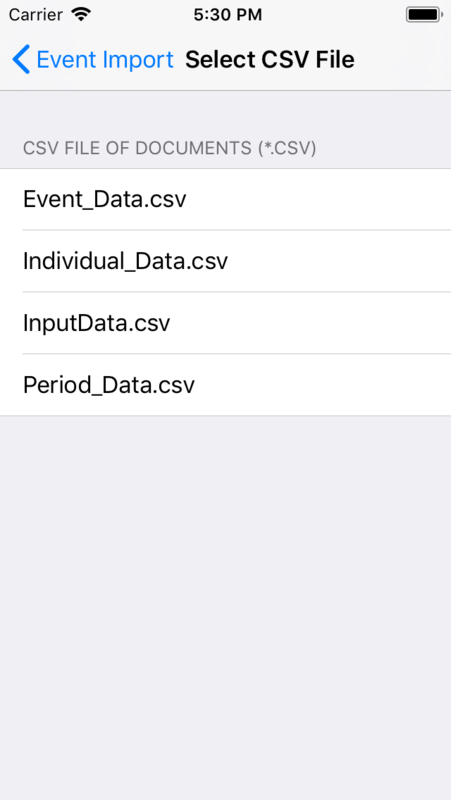 On this screen, it is possible to create Period data from the CSV file in the Documents folder. This page explain the CSV file format for Period data. Check the result content of "Result:" textbox. The lines that can not be input are displayed. When Select from Documents >> button is tapped., and then, "Select CSV File" screen is opened. On this screen, it is possible to create Individual data from the CSV file in the Documents folder. This page explain the CSV file format for Individual data. When Select from Documents >> is pressed, "Select CSV File" screen is opened. 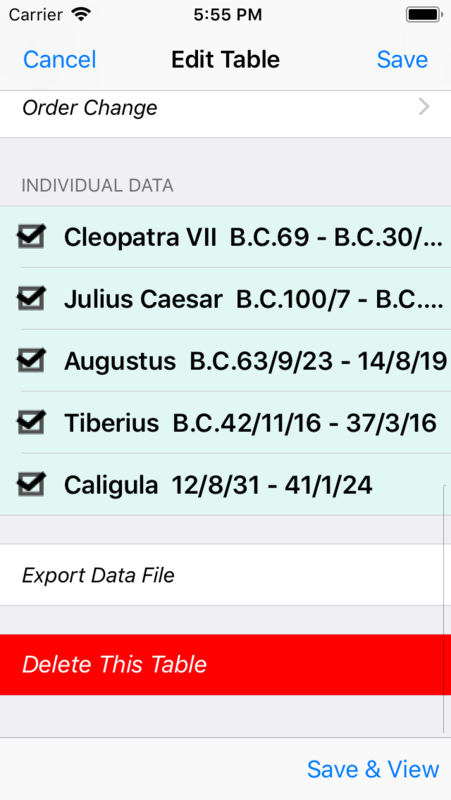 The data file(.ichd2 file) which generated by Change Category screen, Edit Table screen, Edit Individual screen can be imported by this screen. 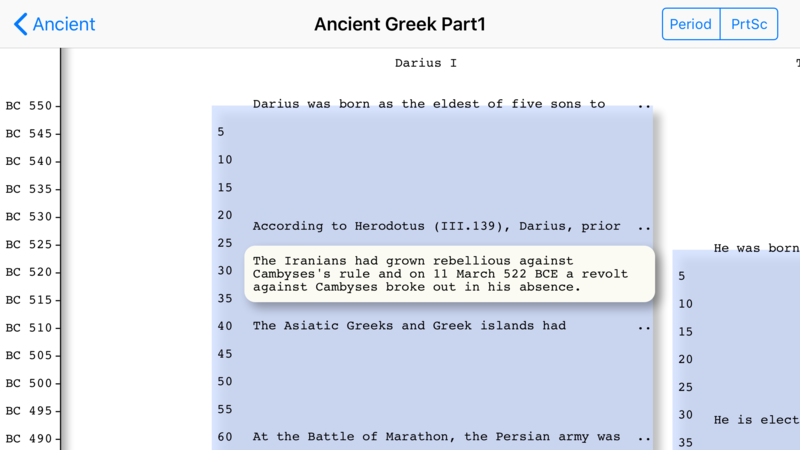 Set the .ichd file for input by Select from Documents >> button. Select [ import | Not import ]. When [ Import ] is chosen, same name data are imported. When [ Not import ] is chosen, same name data is not imported. 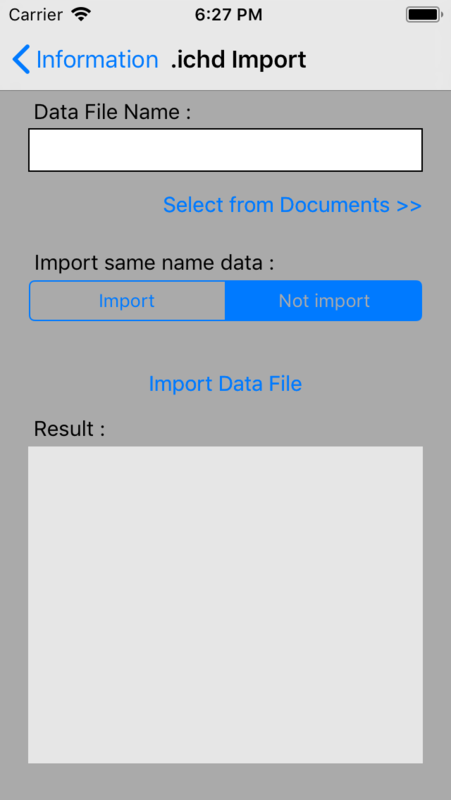 Tap Import Data File button. Check the result content of "Result:" textbox.